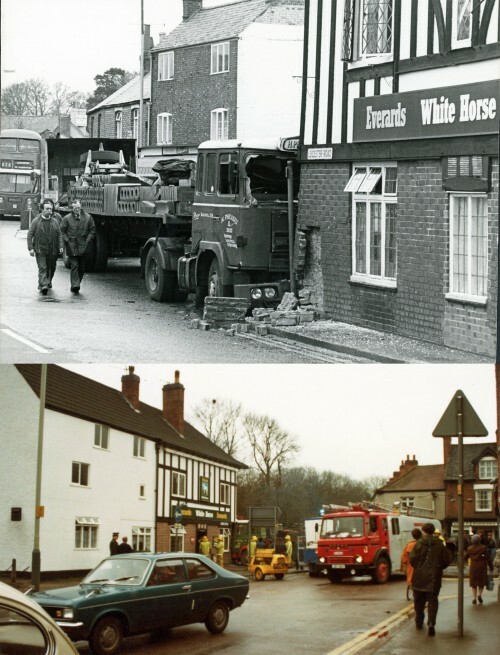 A lorry from Bakewell in Derbyshire, made an unscheduled stop at the White Horse in Quorn in March 1982, when it crashed into the corner of the pub! This view was taken standing on the main A6, looking towards the Loughborough direction. Thank you to Barry Montgomery for lending the museum team these photographs. Barry took over as landlord at the White Horse shortly after this accident. Missing information: Can you identify the two men in this photograph?